Fedora 28 is around the corner and I wanted to highlight what we did to make the Thunderbolt 3 experience as smooth as possible. Although this post focuses on Fedora 28 for what is currently packaged and shipping, all changes are of course available upstream and should hit other distributions in the future. I released version 0.3 of bolt about a week ago, with a lot of internal changes, small D-Bus API changes and support for future kernel changes2. For example it already supports the new USBONLY security level of the upcoming Titan Ridge controller, and the boot attribute; kernel level support for both landed in 4.17. The GNOME shell bits to enable Thunderbolt 3 support were merged some time ago and made it into 3.28. 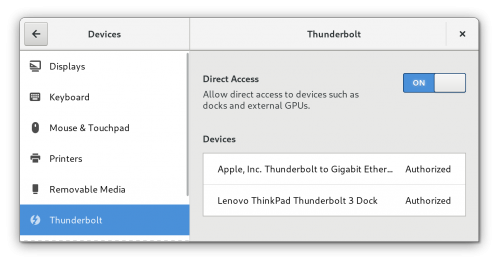 This means that the GNOME shell will act as authorization agent and will automatically authorize new thunderbolt 3 devices — if the user has administrator rights, is currently logged in and the session is unlocked. It will also show a little indicator (called the cable_snake by some) in the status indicator section while devices are being authorized because the whole authorization dance can take quite a while. We have a new panel to manage Thunderbolt 3 devices, woohoo 🎉! It landed in master not too long ago and will be in 3.30, but we backported it to Fedora 28. It lets you remove currently enrolled devices and shows if devices need authorization (they will be listed under "Pending Devices"). The latter might be happening, for example, because the devices were connected while the session was locked. The device detail dialog can then be used to authorize them. Another important feature is the possibility to temporarily disable authorization of Thunderbolt devices. In the panel this is called "Direct Access", because disabling it will stop the authorization of Thunderbolt 3 peripherals, but the DisplayPort and "pure" USB functionality of the thunderbolt port will be preserved. In technical terms, it means that without authorization no PCIe tunnels are allowed to be created, but due to a feature called alternate modes, the thunderbolt port will still allow USB devices and DisplayPort streams to connect. This feature might come in handy if you are traveling, say to defcon: while you don't want malicious devices (like specially prepared thunderbolt cables) to read your main memory, you still want attached projectors to work correctly. Support for updating the firmware of the Thunderbolt host controller and devices landed in fwupd quite some time ago and is of course available in F28 as well. On supported platforms, like Dell, it is therefore only one click away in GNOME Software. Mario also added support to force power the host controller during firmware updates, so updating the host controller is possible without the need to have something plugged into the Thunderbolt port. All in all I am quite happy with the current state of Thunderbolt on GNU/Linux and what we will be shipping in Fedora 28. For most people, connecting Thunderbolt 3 devices should just work. In the next few weeks I will focus on adding support for authorizing devices during pre- and early boot. The bolt Github repository will continue to exist and be a mirror of the main Gitlab repo. Release tarballs will also be available in both locations at least for the next few releases, but not forever, so please update your links. If you are upgrading from bolt 0.1: the database default location has changed to /var/lib/boltd so you might have to re-authorize your devices. Also, devices names are now cleaned-up and stored in the clean form in the DB. If you were running earlier versions of bolt, you might see "Vendor Vendor Device-Name" in the Control Center (see #89). The easiest way to fix this is to forget and re-authorize the device. Is there any word on eGPU compatibility with F28? I know F28 has improved proprietary driver support for NVIDIA and already enjoys good FOSS driver support for AMD cards, but I haven't seen any commentary on combining the improved Thunderbolt support with the improved GPU support. I am trying to get my hands on some of that hardware - I will let you know when I am done testing. I have an eGPU Thunderbolt3 and Lenovo P52 .... I am installing Fedora 29, see if this will work... i'll keep you guys posted.